Nisha Gupta from Maharashtra wears multiple hats. 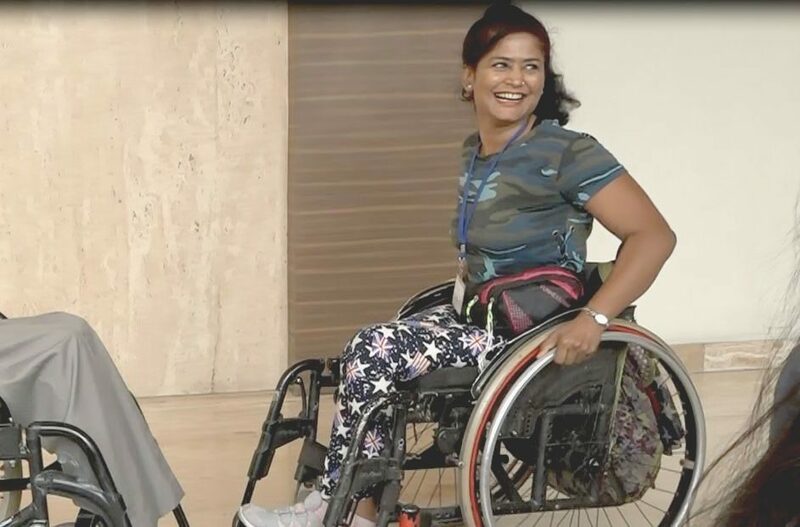 She is not only a trained tattoo artist, but also a state and national level para-swimming champion and a national-level wheelchair basketball player representing India. In this inspiring piece, Nisha shares her experience of overcoming challenges that came her way after suffering a serious head and spinal cord injury. Growing up in the mega city of Mumbai I always looked forward to the summer vacations when I would visit Varanasi, our family’s hometown and my birthplace. In 2004, I was there with my parents during the college break. I was always very adventurous and one day I decided to go out and pluck mangoes from a tree. I vividly remember how my life took an unexpected turn that day. I suffered a fall from the tree which caused serious injuries to my head and spinal cord. I was bleeding profusely and was left with no movement or sensation in my legs. I was rushed to the nearest hospital, which was more than two hours away where I received stitches on my head. I was also informed that not only would I be unable to walk, but I would not have any control over my bowel and bladder movement. My family and I were in a state of shock and did not know how to cope with this. The 24-hour long train journey back to Mumbai was as painful as the surgery and treatment that followed. While the rehabilitation and physiotherapy helped me learn how to sit and stand using callipers, three months went by with no significant improvement. I was completely shattered, traumatised and went into depression. I had lost the will to live. Over the next four years, I seldom left my bed and spent all my time sleeping and watching TV. It was only after I got introduced to Nina Foundation that I found hope. I started interacting with other paraplegics and quadriplegics and for the first time I felt that I was not alone. They inspired me. I shared my learnings and experiences from those interactions with my parents. This was my new life. I slowly started to work from home. I took up a data entry job but my dream was to be a tattoo artist. My childhood friend Kavita introduced me to a tattoo artist who would come over to my house to teach me. This changed my life and helped me in pursuing my passion. My confidence started to grow and I began to participate in several activities. I started going out often with my friends and family though finding accessible places continues to be a challenge. I participated in the Mumbai marathon and started learning wheelchair dancing, para swimming and para badminton. I even participated in the Miss Wheelchair India 2013 contest. Nothing could stop me from pursuing my interests. In 2014, I participated in the state and national para-swimming competitions. Though my family was not very confident initially, I went on to win several gold and silver medals over the course of next two years. In December 2015, I participated in the 2nd National Wheelchair Basketball Championship organised by the International Committee of the Red Cross (ICRC) and the Wheelchair Basketball Federation of India (WBFI) in Delhi where I won a bronze medal. I was part of the Indian wheelchair basketball team that went to Bali where it won a bronze medal. This was the first time that India participated in an international wheelchair basketball competition. I was also recognised as one of the top five most promising female players in the tournament. My passion for sports and life has never been so high. Today, I am proud to say that I am an independent Indian paraplegic girl who believes she can achieve anything she imagines.